Need a mobile tyre fitting service in Oxfordshire? We’ve got you covered! Keeping the police force rolling in Harwell, Oxfordshire. Going to the garage to get a tyre done is just a pain. Driving out of your way, getting from the garage, picking the car up…life’s too short. Our mobile service does away with the hassle. Get in touch with us and tell us what you need. Our expert fitting team will fit your tyres at a time and location that’s convenient to you – at home, at work, or elsewhere. Want your tyres fitted at home in Oxford? It shouldn’t be University Challenge. We love Oxford, but it isn’t the most welcoming place for cars. When it’s time to replace a tyre, battling through the traffic to a garage can be a real nuisance. Fortunately, BK Tyres make getting your tyres fitted at home dead easy. Just order your tyres from our website (or by phone) and we will fit them at your home, or your place of work. It’s quick, simple and straightforward — no Oxbridge entrance exam required! Drop us a line or call us now on 01491 835353 (or 03331 234242 from a mobile). Our mobile tyre fitting service doesn’t just cover Oxfordshire – we also operate in Buckinghamshire and Berkshire. Subject to work load, BK Tyres offers a range of same day mobile tyre fitting services. This may carry an extra charge over our standard prices, but we’ll always make this clear when you book. Abandoned on the A4o? Marooned in Marcham? Give us a call – our tyre fitters will always save you money by repairing the existing tyre. BK Tyres’ fitting vans carry out a mobile tyre repair service in Oxfordshire. We repair tyres to BSAU 159 standard. The cost of attending to your puncture is £36 – when we arrive we will repair the tyre if possible, or failing that put your spare wheel on. 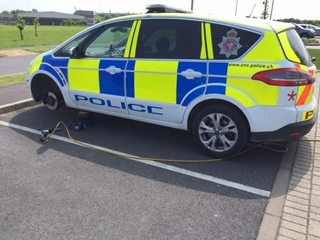 If your vehicle doesn’t carry a spare, let us know the size of the tyre and we will bring a suitable one with us. Your tyre is likely to be repairable if the puncture is in the main tread area and you stopped quickly without overheating the deflated tyre. These prices include VAT. We will supply a new valve (excluding sensor valves), balance the wheel too. If we’re not supplying your tyres and you just need a mobile tyre fitter, please call us to discuss. Call to book any of these services on 01491 835353 (or 03331 234242 from a mobile), or get in touch via the site. Caravan and motorhome tyres face a special set of challenges, because they are often left standing for long periods of time. If your tyres are showing their age, we can supply a full range of replacements, and don’t forget, we come to you.